All Sun Canopy frames are manufactured from naturally anodised 22mm Aluminium tubing with an average wall thickness of 1.6mm and stailess steel heavy duty tubing. All frames are individually hand bent and assembled to ensure the best quality finish. Only quality nylon fittings are used to assemble our canopies. Where the nylon eye ends are inserted into the frame, they are securely fastened with quality pop rivets. 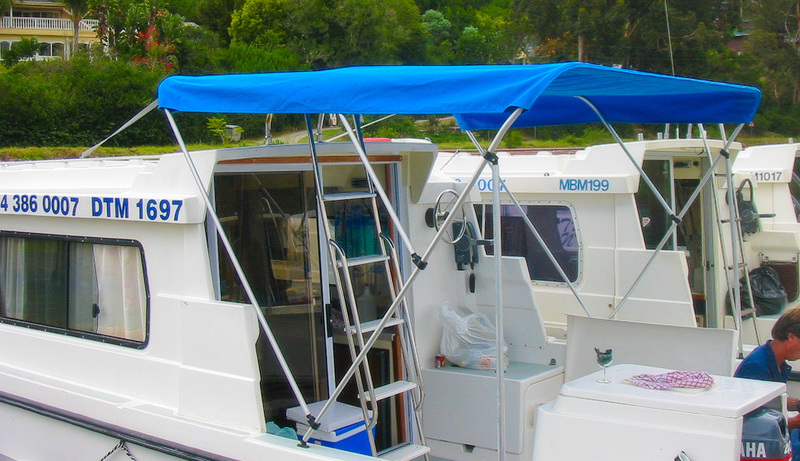 These canopies are supplied with the deck or side mount fittings for mounting the frame onto the fibreglass. These canopy tops are fitted stock standard with medium duty 25mm webbing straps. These are fitted with length adjusting buckles and non-mechanical stainless steel fastening D hooks. All mounting fasteners are supplied with each canopy. This includes all stainless steel screws and nylon saddles. Canopy tops can be manufactured from Aquatex, PVC and Canvas. These canopies are not designed for high speed towing while erected. Ensure it is correctly folded up and properly stowed. Each canopy is supplied with the quality zipped towing sleeve. All Canopies have a standard 12-month limited factory warranty.